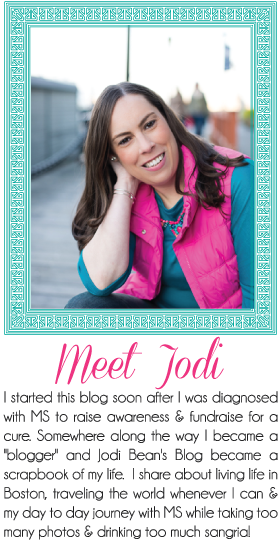 Jodi Bean's Blog: Three Years Ago Today. . .
You are most def an inspiration Jodi! I can't imagine how much stronger and braver you are now. Very awesome. You are such an inspiration! I really admire you! :) I'm so glad that we have "met". Can't wait for our Girls Weekend!! You are such a trooper and I admire you so much!! I knew you were living with MS but I just now read your diagnosis story. I'm so glad you didn't have to live with not knowing and you found out quickly. Does MS run in your family? 2 of John's aunts both have MS. They live in NY. One is doing better than the other one but it's still hard. I admire you so much for telling your story!!! You are an amazing, inspirational, motivating woman. I thought I was following your blog all along. I have been reading it regularly, but just realized you aren`t coming up in my reader. I am an official follower now, finally!